The south Caribbean is often regarded as a fishing paradise. Specifically, Ambergris Caye, off the eastern coast of Belize, is considered one of the best fishing spots in the entire region. With its unique geographical features, such as bays, inlets, estuaries, atolls, the world’s second largest coral reef, lagoons, abundant shallow water flats and easy access to deep, open waters, Ambergris Caye offers a wide variety of fishing experiences and opportunities. Fishing is considered to be good to excellent almost year round. Fishing is generally good year-round in Ambergris Caye, but the best fishing occurs during the months of May through November. If you desire to fish close to land, there are many piers located off of the island. The shallow flats around the many atolls off the coast of Ambergris Caye are some of the most popular areas to fish, and are known to be abundant in bonefish, tarpon and permit. If you want to go for the biggest fish and the best fight, you’ll want to charter a ship to take you out into the deep waters of the Caribbean. The good news is that charter vessels can be found along almost the entirety of Ambergris Caye. On average, to charter a ship for a day will cost $100-175 a person. This typically includes bait, tackle, refreshments, and lunch. Of course, many factors go into the pricing of charter ships, and it’s possible to find ones for much cheaper, or to spend a lot more for a more luxurious expedition. Another important matter when fishing in Ambergris Caye is obtaining a fishing license. Although it is said that local game authorities have a “go easy on the tourists” attitude, it is imperative to obtain a fishing license if you plan on doing any sort of fishing while in Ambergris Caye. A license is required whether you’re fishing will be surf, pier, or deep sea, or anything in between. Charter boats will not let you go out if you do not have a license, but luckily most can facilitate the purchase of one for you. Alternatively, you can purchase your license online. A one-day license will cost you only $10, and a week-long license only $25. Ambergris Caye isn’t known as one of the premiere fishing destinations in the Caribbean region for no reason; it offers a wide, varied variety of fish, most of which can be caught almost year round. Let’s examine some of the most popular fish to chase after in this Caribbean fishing paradise. Ambergris Caye offers some of the best bonefish fishing in the Caribbean. Bonefish are one of the three big fish that people come to Ambergris Caye to go after. They are extremely plentiful in this region and you are almost guaranteed to catch at least one a day if go to the right spots. They can be found in the flats of the reefs and atolls in the area around Ambergris Caye. The mangrove-lined lagoons are another popular and fortuitous spot for bonefish. Belize has been referred to as the “permit capital of the world.” Indeed, this name is not given without reason. Belize, and specifically Ambergris Caye, has some of the best permit fishing in the Caribbean, if not the world. Permit can be fished in the waters of Ambergris Caye pretty much year round, although the best time to go after these aquatic beauties is when the winds are most consistent. This equates to pretty much all of the year except during the fall. The wonderful thing about permit fishing in Ambergris Caye is that they can be found in almost any of the waters. Whether you want to chase some massive behemoths out in the open sea by chartering a boat, or you’d rather stick closer to shore and fish the shallower flats, you can find permit in almost all of waters of this Caribbean fishing paradise. Tarpon fishing in Ambergris Caye is some of the best in the Caribbean. 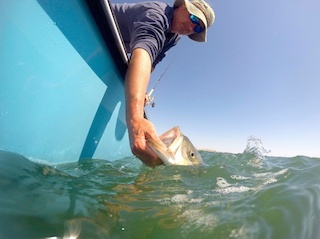 Unlike the permit and the bonefish, tarpon is a more seasonal fish. Tarpon are a migratory fish, and they make their way past Ambergris Caye starting in April/May, and their presence in the area drops off around September/October. The best months for fishing tarpon are right in the middle of this, during the months of June, July and August. 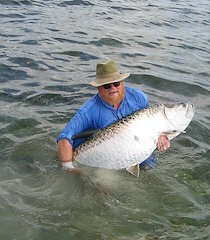 Most tarpon are found in the rivers, creeks, channels and lagoons off of Ambergris Caye. Tarpon in Ambergris Caye are on average 60-90 pounds in inland habitats, and get larger in the more open waters, ranging in weight from around 100-150 pounds. Some tarpon can even grow to weights approaching 200 pounds, although this is rare. The best place to go fishing for snook is in the mangrove-lined lagoons. Snook cannot survive in cold weather, so if there is a cold front, they may migrate into shallower waters to stay warm. The best months to go fishing for these beauties is March through November. 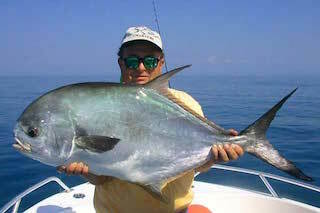 Jack Crevalle are very strong fish, known to put up a very formidable fight. If you’re one of those anglers who enjoy the thrill of fighting with a strong fish on the other end of your line, this is a great fish for you. Jack Crevalle can be found in all different locations in the Ambergris Caye region, from shallow flats near the shore to rivers and even open waters. They typically run in schools of a few dozen to a few hundred, and are most abundant from February to November.